have lurked in Shadow for millennia. But the danger also comes from within as the Emperor, son of the Moon, is getting old, and his formerly loyal lords are now trying to seize power. These aspiring clan lords will make their appeal to the warriors known as ninjas, adepts of the way of Shinobi. The clans are prepared for war! As a lord with a thirst for power, in Shinobi WAT-AAH! you intend to place your honorable posterior on the imperial throne. Your plan is to appeal to the large clans of ninjas, who will empower you to impose your military strength upon your enemies. To put it simply, your goal is to put a big WAT-AAH! in your enemies’ faces! 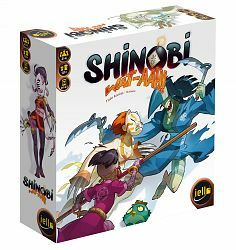 • the Grasshopper Mode lets you get started right away in the art of Shinobi with short games. • the Grand Master Mode will train you over the course of three rounds, leading up to a most surprising ultimate confrontation! • Place cards (optional) face up in front of you to start a new clan or to reinforce an existing one. You start a new clan by playing 2 to 4 cards of the same color. Playing 2 triggers the clan’s effect, while playing 3 or 4 triggers a more powerful version of the same effect. To reinforce a clan, add 1 to 3 new ninjas of the same color, or a powerful Yokai (wildcard). There can never be more than 4 ninjas and Yokai in the same clan. • Discard a card from your hand. The game ends immediately when a player places their fourth clan. Each players scores the sum of their ninjas’ strength, minus the total sum of the values of the cards in their Corruption pile. The player with the most points wins. • Simple yet aggressive gameplay. • 2 game modes for short sessions, or more strategy. • Incredible artwork by Naïade.